Spring time is the season of renewal, the perfect time to upgrade your wardrobe with some new hot fashion picks. These trends will help you transition easily from one season to the next. Here are 5 fashion essentials for spring 2017. Typically spring is all about the colors. This year, we’re loving that metallics are on the upswing. 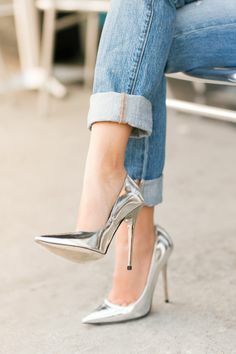 If you’re not ready to take the plunge on that bronze midi skirt or gold jacket, an easy way to incorporate this trend into your outfit is with accessories, so dare for a bold pair of shoes or handbags. It’s officially spring ladies, and we can’t think of a better way to welcome the warm-weather season than buying floral, colored clothes. Spring collections mean inevitably floral motifs and prints. So dare to bloome with beautiful blouses, dresses, and skirts in the finest of allover floral prints. Check out these beauties. It’s no secret pastels are hot for spring, from light pink hues, baby blue, lemon and mint, pastels are popping up everywhere this spring season. If you’re not ready to go with full-on pastels, just wear ice-cream shade accessories or individual pieces, and pair it with neutrals. Leather had definitely made a major comeback these years, being a versatile look, which can be restyled easily. For an off-duty look, or an office outfit, to a night out on the town, we have gathered some Vero Milano styles, especially to inspire you. From brown or black dresses accessorized with various embellishments and chic jackets that will keep you warm in the coldest days, dare to try the unexpected and add an edgy touch to your look.